For generations, the dwarf population of Faerûn was in decline. Extinction seemed certain until the Moradin, god of dwarves, intervened and provided them with the Thunder Blessing. Since then, birthrates among dwarves have risen to about half that of the humans, leading to a resurgence in the number of dwarves living in Faerûn. Only one dwarven race was denied the Thunder Blessing: the evil duergar, who are the gray dwarves of the Underdark. After enduring generations of slavery and torture at the hands of their former masters, the illithids, it came as little surprise to the gray dwarves that the gods did not grant them the blessing given to the other dwarven races. As far as they were concerned, Moradin had abandoned them long ago. 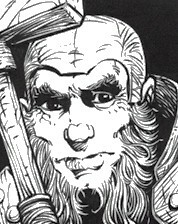 Most duergar were content to go on as they had, which was working as arms dealers for the many warring races of the Underdark, despite their being left out of the Thunder Blessing. A precious few took more than a passing interest in the favor Moradin had bestowed upon the other dwarven races but withheld from the duergar -- and of these, a bare handful bothered to ask "Why?" Thordek Stonebreaker was one of these few. For many years, Thordek led a comfortable life as a swordsmith, and he tirelessly forged the steel blades that fuel the never-ending conflict between the races of the Underdark. Then one day, a drow customer complained to him about the dwarves' new-found fecundity. "If things keep going this way," the drow said, examining the blade of the longsword he'd commissioned from Thordek, "the little blighters will overrun the Underdark, and the surface, too, in another thousand years or so. But you already know everything about this, don't you, being a dwarf yourself?" Thordek simply mumbled, "No." Disturbed by the drow's comments, Thordek sat down to think. In the meantime, the customer left -- without paying. For days, Thordek neglected his forge. He did not eat or sleep. He could do nothing but sit on his stool, with his chin resting on his hand, and think. How had the other dwarven races become so fecund, while the duergar were still dwindling? If the duergar continued to decline the way Thordek thought they were, they would certainly die out. Thordek found this proposition strange since the duergar are a hardy race focused on survival, but he could not refute it. The illithids, he reasoned, would almost certainly not die out. They had survived in the Underdark for countless centuries and would survive for countless more. If the duergar disappeared and the illithids did not, the illithids could claim ultimate victory in their war with the duergar. If the illithids' victory was inevitable, Thordek thought, why had the duergar rebelled against them in the first place? What difference did it make if the gray dwarves lived free or as chattel if their ultimate end was the same? Finally, after starving himself for weeks, Thordek did something truly strange for a duergar -- he prayed to Moradin. Stranger, though, was Moradin's answer: The god of dwarves accepted Thordek as a cleric. This made Thordek one of the few gray dwarves in the god's service. With this divine inspiration came a change of heart and a new confidence that the duergar could be saved from extinction. Moradin had not given Thordek the answers he sought, but he had, perhaps, given him the means to find them on his own. Amazed by his revelation, Thordek longed to speak to his fellow smiths about what he had learned. But he knew that his ideas would be seen as dangerous and heretical, and the other duergar would probably brand him as a traitor. They would tattoo his face, he knew, to mark him forever as an exile, before banishing him forever. So, Thordek took up his hammer and quietly slipped away, going voluntarily into exile before his fellow dwarves could expel him. Thordek found the surface world even more unforgiving than the Underdark for one such as he. Other dwarves bore a deep hatred for the duergar and wanted nothing to do with him. Even the open-minded humans treated him with loathing and suspicion. Still Thordek persevered. He wandered through Faerûn and spoke with anyone who would let him. Everywhere he went, he sought information about the Thunder Blessing, about the history of the dwarves, and about the transgressions for which, he believed, the gray dwarves were being punished. During his journeys, Thordek heard of another exile from the Underdark -- a strange drow from the city of Menzoberranzan. Perhaps, Thordek hoped, he would meet this drow one day. Only he, the duergar reasoned, could understand the trials the surface world held for a native of the Underdark. Thordek is only a little closer to his goal now than he was when he started, and Moradin is not granting him any easy answers. But Thordek remains more patient and unyielding than stone. He must find a way to atone for the duergar and bring the Thunder Blessing to them, as well -- the alternative is to allow the duergar to perish and hand ultimate victory to the hated illithids. Thordek Stonebreaker: Male duergar Clr 10; CR 10; Medium-size humanoid; HD 10d8+20; hp 80; Init +0; Spd 15 ft.; AC 20, touch 10, flat-footed 20; Atk +11/+6 melee (1d8+4/x3, +2 warhammer); SA spell-like abilities, turn undead 2/day; SQ duergar traits; AL LN; SV Fort +12, Ref +4, Will +10; Str 15, Dex 11, Con 14, Int 11, Wis 15, Cha 9. Skills and Feats: Concentration +9, Craft (metalworking) +2, Craft (painting) +6, Craft (stoneworking) +2, Knowledge (religion) +7, Listen +5, Move Silently -1, Profession (weaponsmith) +10, Spot +5; Alertness, Combat Casting, Great Fortitude, Martial Weapon Proficiency (warhammer), Power Attack, Silent Spell, Skill Focus (Craft [painting]). Spell-Like Abilities: 1/day -- enlarge, invisibility (self and items carried). Caster level 20th; save DC 9 + spell level. Duergar Traits: Thordek has a +1 racial bonus on attack rolls against orcs and goblinoids, a +2 racial bonus on saves against spells and spell-like abilities, a +2 racial bonus on Fortitude saves against all poisons, and a +4 dodge bonus against giants. He also has darkvision (120-foot range) and stonecunning (+2 racial bonus on checks to notice unusual stonework; can make a check for unusual stonework as though actively searching when within 10 ft. and can use the Search skill to find stonework traps as a rogue can; intuit depth). Thordek is immune to paralysis, phantasms, and to magical or alchemical poisons (but not normal poisons). He has light sensitivity (-2 circumstance penalty on attack rolls in bright sunlight or equivalent), and he gains Alertness as a bonus feat. He also has a +2 racial bonus on Appraise checks and Craft or Profession checks related to stone or metal, a +4 racial bonus on Move Silently checks, and +1 racial bonus on Listen and Spot checks (already figured into the statistics above). Spells Prepared (6/6/6/4/4/3; save DC 12 + spell level): 0 -- detect magic (2), guidance (2), virtue (2); 1st -- bless (2), magic weapon*, obscuring mist (2), sanctuary; 2nd -- bull's strength, consecrate, darkness (2), endurance*, make whole; 3rd -- deeper darkness, dispel magic, meld into stone, stone shape*; 4th -- minor creation*, restoration, tongues, weapon of the deity; 5th -- battletide, break enchantment, commune, wall of stone*. *Domain spell. Deity: Moradin. Domains: Craft (cast creation spells at +1 caster level; Skill Focus in selected Craft skill as a bonus feat), Dwarf (Great Fortitude as a bonus feat). Possessions: +2 chainmail, +1 large metal shield, +2 warhammer, masterwork sling, backpack, holy symbol of Moradin, potion of cure moderate wounds (3), +1 cloak of resistance.